7 Traditional Musical Instruments from Various Countries - Every country has a variety of traditions and cultures. Starting from music, dance, routine events, to other things that are part of the country's identity. Also included are foreign traditional musical instruments that they have. You can see for yourself how many traditional musical instruments our country has, more so when combined with a variety of traditional foreign musical instruments that add diversity. Here, you can recognize 7 traditional musical instruments from abroad. The following are various traditional musical instruments from various countries in the world. Often hear the term "body shape like Spanish guitar"? Well, this country-specific guitar is indeed quite famous in the world. At first glance the guitar that has the name Flamenco is almost the same as the classic acoustic guitar in general. What makes this guitar different is in terms of raw materials which make the sound produced softer. The size tends to be smaller. Many consider that the Flamenco guitar is better played by picking it directly with the fingers to produce a perfect sound or not using the help of a pick. This guitar is often used by Spanish people in many events. Still both from the Continent of Europe, one of the traditional musical instruments belonging to the Windmill Country, namely the Netherlands is an organ. A glimpse of the organ looks like a piano because it's almost the same shape. But on the musical instrument organ there are many pipes that become the source of sound. As time went on, the Dutch musical instrument continued to grow and was known by many other countries and usually existed in churches that still used the classical concept. Furthermore there is a bagpipe originating from Scotland where it is part of Great Britain. This traditional musical instrument is in the form of a bag that is given a pipe as a sound source. The way to play it is blown. 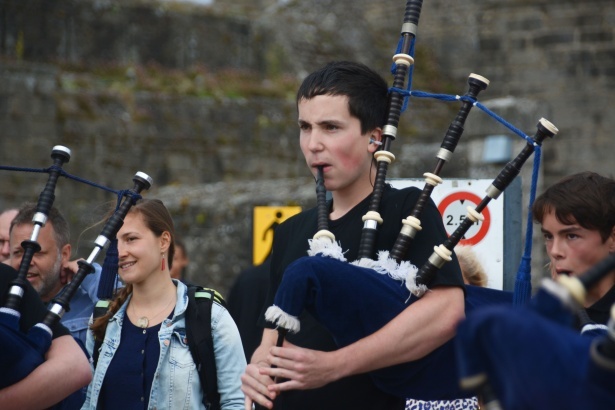 There are five pipes, four pipes above and one pipe at the end of the bag called a chanter. To adjust to the Scottish state identity that is identical to Tartan cloth usually in the bag using tartan patterned fabric. The fourth traditional musical instrument is mbira. Mebira originated from Africa, where many types are now the result of the development of these instruments. Mbira is made of wooden city with space and metal pieces which when pressed it will issue a pitched sound source. Musical instruments resulting from the development of mbira include kalimba and piano thumb. Traditional Arabic music is indeed familiar especially for the people of Indonesia. One of the traditional foreign musical instruments in this country that adds color to its distinctiveness is Qanun. Qanun is often called Arabic harp. The shape of this instrument is half a trapezoid with a number of strings of 81 pieces. How to play using four fingers. It takes a high skill to play this one instrument because it is classified as a traditional musical instrument that is not easy to play. Grajabpi is often used in many traditional and cultural events in Thailand. Usually players hold the instrument when playing it. The Philippines also has many traditional musical instruments and one of them is a pedestal. Maybe you would be mistaken when looking at the appearance of this instrument because its appearance is almost the same as Indonesian's flute. Tumpong is made of bamboo stems that have five holes, one hole is above and four holes are below.